THIS IS A LOVELY SEA POINT UNIT ON THE BACK ROW WITH GOOD OCEAN VIEWS FROM THE LIVING LEVEL AND PANORAMIC FROM THE MASTER. THIS 'LARGEST' FLOORPLAN BOASTS MODERN UPGRADES FROM SMOOTH CEILINGS WITH CROWN MOLDING, NEWER KITCHEN AND BATH CABINETS AND NEW GRANITE KITCHEN COUNTERS. IT HAS ELEGANT HARDWOOD FLOORING THROUGH THE LIVING ROOM, MASTER BEDROOM AND ON STAIRS ALONG WITH WOODEN BANNISTERS. THE FRONT DOOR AND ALL INTERIOR DOORS ARE NEW, AND THE WOOD DUAL PANE SLIDERS ARE NEWER INSTALLATIONS. See suppl, ALL BATHROOMS AND KITCHEN HAVE DURABLE TILE FLOORING. ALL CLOSETS ARE ORGANIZED. SEA POINT ENJOYS TERRIFIC AMENITIES WITH THEIR TWO POOLS EACH WITH A SPA, A LARGE CLUBHOUSE, 2 NIGHT-LIGHTED TENNIS COURTS AND A 4 ACRE PARK WITH KIDDIE PLAYGROUND, A VOLLEYBALL COURT AND A PLACE TO RUN YOUR DOGS. TORREY PINES STATE BEACH AND PARK ARE WITHIN WALKING DISTANCE AS ARE SEVERAL RESTAURANTS ON CARMEL VALLEY ROAD. 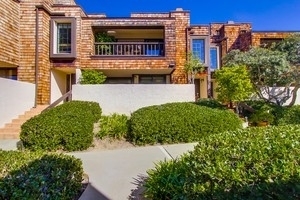 DOWNTOWN DEL MAR IS CLOSE AND THERE IS EASY ACCESS TO I-5 AND STR 56. SEA POINT IS A GREAT PLACE TO CALL HOME!